The Christian Missions Theological College and Seminary, also known as Bible Training Center for Evangelism, is a nondenominational evangelical training college established in 2006 to train men and women for the ministry of the Gospel in the most isolated and unreached communities of the world. The programs at the bible college are offered in partnership with Triune Biblical University, and the International Association of Bible Institutes. The levels of study range from Certificate to Doctoral degrees in Theology, Christian Counseling, Christian Education, Biblical Studies, etc. Lessons are delivered through the Residence Training Mode (RTI) on campus, as well as Distance Training Mode (DTI), online, as block release modules and weekend classes. In spite of its humble beginnings back in 2006, the school has grown to have several branches in the country including Harare, Mutare, and Masvingo. The Domboshawa Theological College was established in 1991 through the vision of Pastors Phineas Dube and Alan Spence. Its purpose was to meet the demand for a uniquely Zimbabwean style of theological education at university level, and practical ministry training. Domboshawa is an indigenous institution- created by Zimbabweans for leaders of the church in Zimbabwe – and beyond! The Bachelor of Theology and Religious Studies is offered in affiliation with the Zimbabwe Open University. As an interdenominational institution, this bible college seeks to provide biblically faithful, academically accredited and contextually relevant training, resulting in the provision of sound Christian leaders for churches, para-church organizations, and schools. The college is currently offering a special first-semester welcome scholarship of 50% tuition fees to the first 15 students to enroll for Saturday classes. Located in Chimanimani, Zimbabwe, the Rusitu Bible College exists to bring glory to God by helping students develop the godly character that is necessary for servant leadership. This college was started by the African Evangelical Fellowship (AFI) and is affiliated with the United Baptist Church of Zimbabwe. Currently, this college offers three-year Certificates and Diplomas in Biblical Studies. Salem Full Gospel has supported (mostly indirectly, through general support through IAF) the Salem Evangelical Bible Institute, located in Harare Zimbabwe. This school is an oasis of God’s peace, in a wasteland of confusion. The school grows much of its own food, and has its own well on the grounds, thus teaching the ministry students practical skills to help them support themselves. Zimbabwe is a country of rampant inflation and government corruption. This training center, however, offers hope to a dying nation. 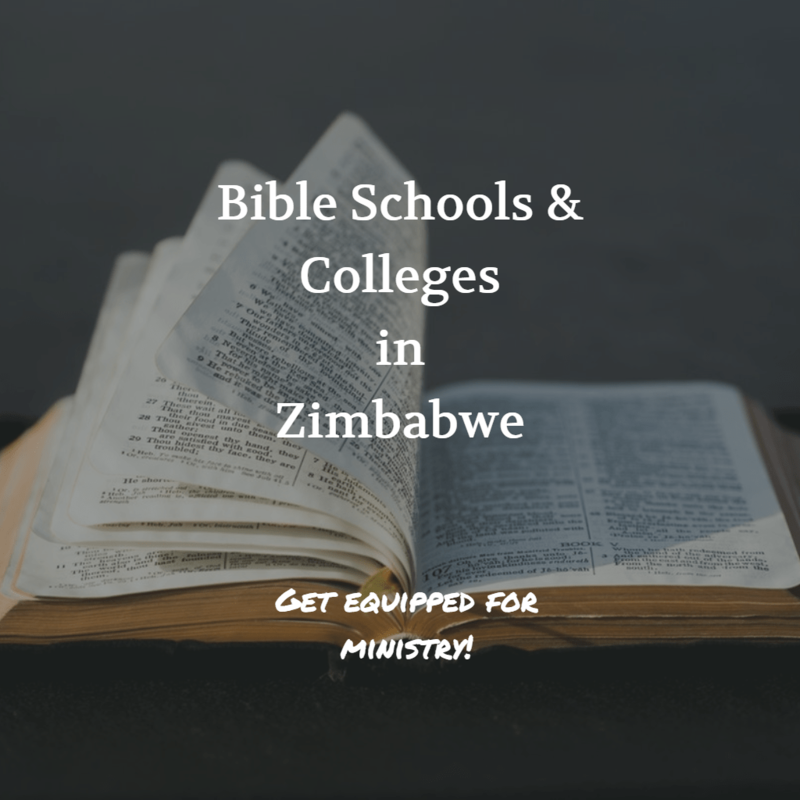 The Theological College of Zimbabwe is an institution of the Church that is involved in the strategic ministry of developing Christian leaders for the Church and society. TCZ aims to equip Christians for effective and relevant service to both the church and society. The campus provides its students with a conducive learning environment, with versatile world-class and technologically advanced facilities. This institution offers accredited programs that are recognized both locally and internationally. Students can choose to pursue either a Diploma in Theology or a Bachelor of Arts in Theology. The United Theological College is located eleven kilometers east of Harare. A group of eight Mainline Protestant Churches currently owns it. UTC believes that individuals and communities can be transformed through quality education and the witness of the Church. As such, the provision of quality education to individuals who are interested in pursuing theological and academic excellence is of great importance. Through its academic programs, UTC provides authentic priestly, pastoral and prophetic leadership within Zimbabwe, the Southern African region, and the world. Students can start at the Certificate or Diploma level, and go all the way to earn a Bachelor’s degree (Bachelor of Theology and/or Bachelor of Religious Education) at this institution. Harare Theological College was started in the Zambezi valley in 1953 as part of missionary efforts of the Evangelical Alliance Mission (TEAM) in Mavhurdonha. This college, located in Avondale, a short distance from Harare city centre, is a community of students, staff, and personnel who share a commitment to Jesus Christ. Training of leaders for the Zimbabwean church is the primary goal of HTC. Servant leaders are equipped to know biblical truth, practice godliness and be effective in the ministry through certificate, diploma and degree courses. Christ College is an associate college of the Zimbabwe Open University. The founders, Bishop Professor Washington and Bishop Tendai Mahiya started this college in 2005 with the vision of offering academic excellence that empowers people to shape the future. Christ is the integrating center of this college and is at the core of all the college activities. As a result, the graduates of this college think critically, live faithfully, and impact their spheres of influence effectively. Through its diplomas, bachelor’s, masters and doctoral degrees, Christ College aims to be a leading contributor to academic excellence in education.